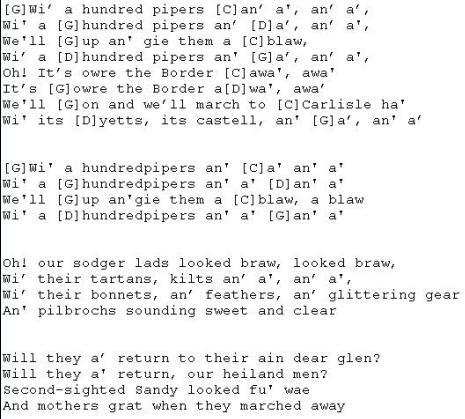 Wi' A Hundred Pipers Guitar Chords And Lyrics. A Scottish traditional song written by Carlina Nairne which tells of when Bonnie Prince Charlie's army marched into Carlisle and were greeted by a hundred pipers. The youtube video is by Steve McDonald and is one of the finest ever versions, he does an intro. but not on the pipes but on what sounds like a low whistle.